Ads! Ads! Ads! They are very irritating and can irk any user if in large numbers combined with wrong positions. One such popular app with lots of annoying Pop-ups and Interstitial Ads is MX Player. MX Player is the most popular Android App for playing stored videos on your Android device. It is also one of the rare apps which support video streaming on all major networks. Or in other words, many online streaming services consider MX Player as primer best app for the duty. The MX Player Apps earlier versions were very good in add positions and also showed minimal ads generally at bottom of the screen. But the new updates are very much rattling as they show up as banner ads in-between the video grid. They also pop-up as interstitial Ads which is enough to displease you. Today in this post I will tell how you can block and remove these Ads from your MX Player. The Pro version of MX Player has Zero Ads and also comes with some added features which lack in MX Player Free. This method could reduce the number of Ads on MX Player. For your information, Google Ads work when you are connected to the internet thus loading personalised ads on the Android. So, you can restrict the Background Data for the MX Player App on our device. Though this will not completely result in AdBlocking but will make a decrease in usage of the data by the App and thus decrease in the number of Ads. You can block Pop-Ups and Interstitials on your Android Apps especially if the Ads are from Google with this simple changes in Google Settings. 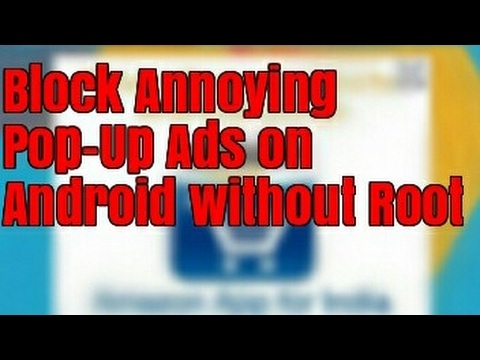 You can block ads on your device with the help of an AdBlocking App for Android. The app will create VPN network and block the Ads with Ad Scripts on the device. Download and install F-Droid File on your phone. Now click on ‘Domain Filters’ option at screen bottom. Here click on Ad-Away Host Files. Now Long Press on Power Icon, if you see the message of files missing then hit the refresh button and let the files download. Now gain Long Press on Power Icon and connect the App to VPN. You will see a key shaped icon on successful connection. Ad Blocking Done! If your device is rooted you can try many methods and apps to block Ads on the Apps. One such specific method is to block Foreground data on Android. Foreground data cannot be restricted in Non-Rooted devices. Download DroidWall from Google Play Store. This app acts similar to the firewall on Windows PC. There you can see all your applications listed. Select the MX Player and disable the data access blocking all sort of ads completely. Note & Conclusion: I hope the post was helpful. Do comment for any of the assistance or support if needed. Cheers! If you've any thoughts on Remove Annoying Ads from MX Player for Android, then feel free to drop in below comment box. It’s a one time charge of $5 and worth every cent. Just pay for the damn thing.